When I was a child, I found chocolate fascinating: Where did it come from? How was it made? What magic was behind this sweet and creamy goodness? The truth is I’m not sure I ever found exactly the answers I was looking for. So, as I endeavor to add a bit of learning into this Christmas for my boys, I went straight to a professional — Bryan Graham, the chocolatier who founded Fruition Chocolate (part of the team behind the Chocolate Space Invaders). Now he’s an expert, creating small-batch confections in his “bean-to-bar chocolate workshop” in New York’s Catskill Mountains. Graham talked me through why chocolate is so special and how it goes from harvest to the delightful goodness we know and love, especially around the holidays (when many children’s chocolate consumption rises). Wired.com: Chocolate is a special confectionary, what is it about chocolate that has inspired you to create Fruition and what do you want to share with others? Bryan Graham: My background is in pastry and baking. I’ve worked for many years as a pastry chef, bread baker and confectioner. I always had an affinity for working with chocolate and eventually began focusing on it exclusively. After diving in and learning all I could about elaborating chocolate into confections, bars and sculptures, the next logical step (for me at least) was to learn how to make the chocolate itself. After months of poring over dense technical texts and speaking to every expert I could find, I finally put together a small chocolate laboratory in my home kitchen and began churning out small batches of chocolate. Three years later, after countless batches, tweaking and experimentation, I was confident enough to release my chocolate to the world, using my business, Fruition Chocolate, as the vehicle. The flexibility of chocolate is what I love most about it. It can be incredibly satisfying to simply taste a little piece of great, unadulterated chocolate and let the flavors wash over your palate. It can be equally satisfying to taste an elaborate and boldly decorated confection full of ganaches, preserves or fondants, in which chocolate takes on a complimentary role. Chocolate is also extremely democratic. You don’t need to have studied and tasted every great chocolate in the world to appreciate it. Nobody should tell you how to experience it. If you want to just pop it in your mouth and munch away, great! If you care to taste the same piece and experience the flavor release, and all the subtlety and complexity, it’s there for the taking. Wired.com: Children eat a lot of chocolate; how can we inspire them to think beyond the wrapping and its contents? Graham: I think we need to help our children make the distinction between chocolate and candy. Certainly children eat a lot of candy, but many of the treats that we call chocolate bars — Snickers, Cadbury Dairy Milk, etc. — contain just about everything but chocolate. Talking to kids about chocolate is an opportunity to take a subject that they are notoriously excitable about and expand on it in so many ways. 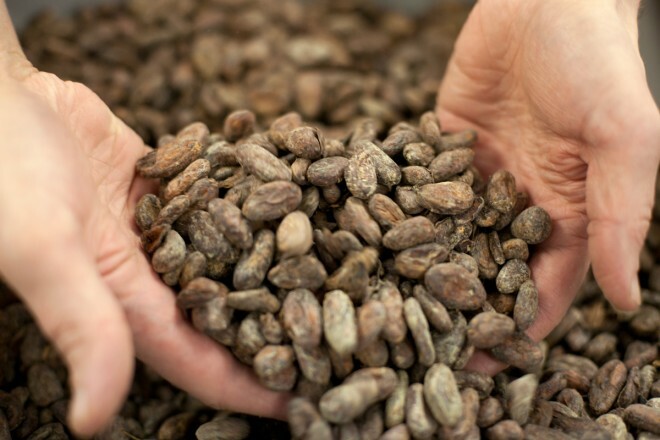 Botany, geography, farming, international import, processing and tasting are all key components in transforming the humble seed of the tree Theobroma cacao into chocolate and confections, and a great springboard into a conversation about where chocolate — and all of our food — actually comes from.